In Alcatel OneTouch Hero 8020D USB cable connector is also used for charging the phone. Because of excessive use or any other reason USB connector can be damaged. 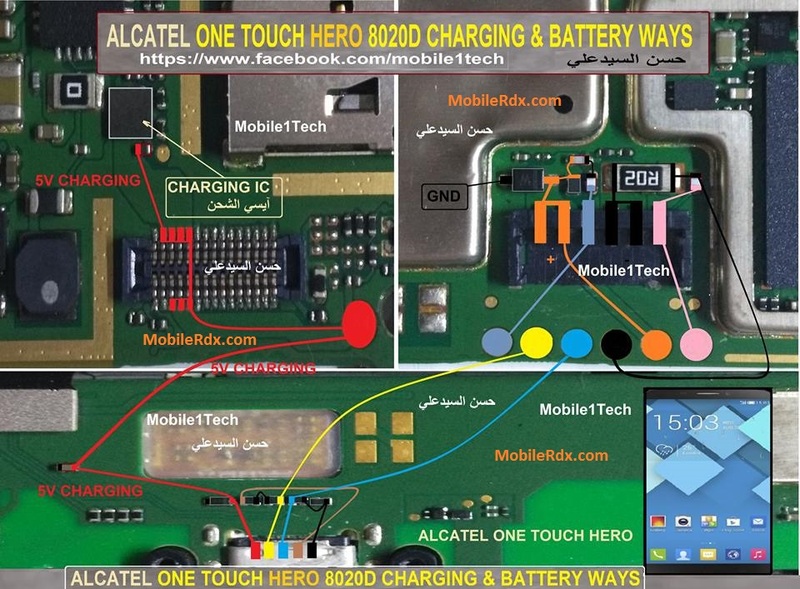 So if you are experiencing any charging problem or problem connecting your Alcatel OneTouch Hero 8020D Charging Ways Solution Usb Jumper to your computer via USB cable then it is possible that your Alcatel OneTouch Hero 8020D charging connector is faulty. Replacing it with a new one is the only solution here. But if by any chance the USB connector prints are broken then you have to make the jumpers as shown in the diagram below. First check the fuse if open or damaged, second check the diode if shorted. Check the resistor near the power IC. Re-solder or replace if damaged. Trace the VCHARGE (charging voltage) line paths and the ground of the charging pads. Put Battery in again and connect charger.